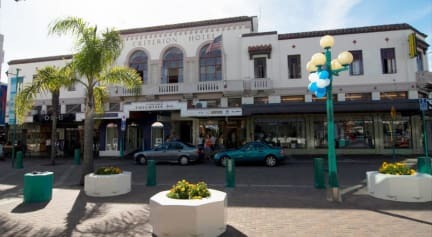 The Criterion ArtDeco Backpackers is a Unique Spanish Mission/Art Deco Style building Located in the heart of Napier and just 1 minutes walk from the isite (Information centre) Criterion -Napier's largest Spanish Mission / Art Deco style building and one of the most photographed buildings on the art deco walk.. 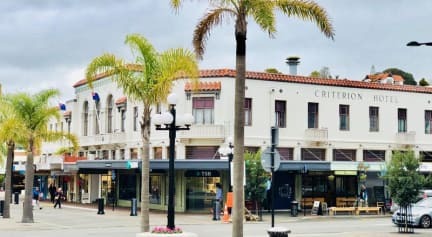 Originally built as a luxury hotel in 1932 after the famous Hawke's Bay earthquake, the Criterion has recently been refurbished and now provides travelers with a comfortable base for exploring the Hawke's Bay area. (Please note our hostel is suitable for children, we have a family room available. The Criterion Art Deco Backpackers exceeds all expectations for budget accommodation with friendly and helpful staff, a Free Continental Breakfast , spacious kitchen area ,A relaxing lounge, a cozy large dining and television room with SKY TV, an entertaining pool table, table tennis free local phone calls, free wifi internet and breathtaking sunsets from the verandah. Need to show photo ID on arrival. day of arrival, avoid a cancellation fee. Bathrooms could do with some attention. For a backpackers this was pretty good. I did have issues with bed bugs but I understand the new managers have instigated an eradication program so once this is sorted I'd happily recommend this place. Kitchen is roomy. Lounges and TV room are accessible and there is a good vibe. New managers are very friendly and helpful. Beds are comfortable enough and toilets are generally clean. Great location within city center to check out the Art Deco scene. One downside is there is no reserved parking and you have to find parking further away. Good location! Okay hostel. They were really friendly and helpful when I had questions and needed help. They didn't have salt, pepper or cooking oil in the kitchen. Security is average. I'm pretty sure randoms were walking in off the street and helping themselves to breakfast and facilities. The place is in desperate need of a birthday, the room we had was clean but run down, the sheets had stains on them (I trust they were clean) and a single sized duvet for a queen sized bed, not ideal for 2 people. Go somewhere else. My husband got bitten by bef bugs. We had to sterilise all our cloths. So first of all, there was a dude smoking actual d**** on the top terrace as well as in his room. Like, w*** and cigs I get, but d****?! Gross. Also, blood stains on the sheets and pillow case were SUPER GROSS AND SKETCHY. On top of all of that, I found a bed bug in my bed and bailed out as soon as possible. Lights were out all along the corridor, giving it an extra d***-induced-overdose-vibe. Also, the pictures on your website are CLEARLY taken from another hotel/hostel, which is so misleading.